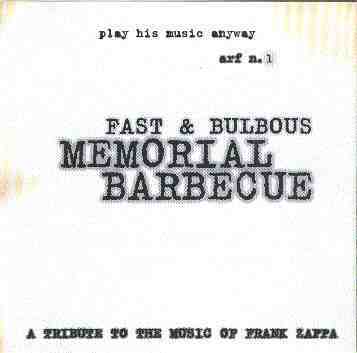 In 1997, Fast & Bulbous released a very impressive album called "Memorial Barbecue". A couple of years after that, the band contributed to "Frank You, Thank! 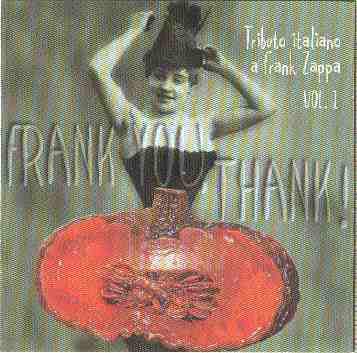 ", an album that featured Italian bands performing the music of Frank Zappa. In 1998, they played at the Zappanale festival, a recording of which got released int 2000. 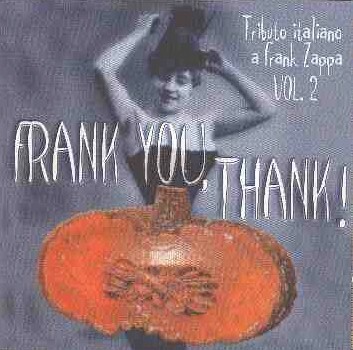 In 2003, the band contributed another song to the second volume of "Frank You, Thank! ", but this time as Fast & Bulbous Jelly. The band still included Gianluca Di Mattia and Paolo Maggitti, but featured Niki Barulli on drums and Arturo Grilli on bass. 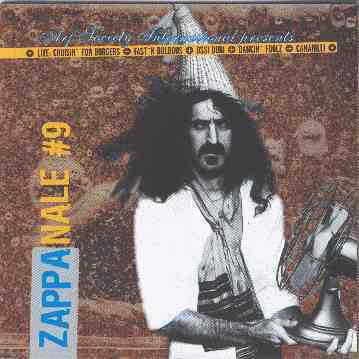 parts were released on "various artists: zappanale no.9"
What an excellent tribute album. Here are a few of my first reactions as I listen to it. 2. Watermelon- Ah, the forbidden track. You probably know that the ZFT has requested this song not be played, apparantly by request of Frank. Well, as they say on the back cover, "play his music anyway". The segue into this song is quite remarkable. They take the last two notes of "Little House", the ones that are sung "Mud Shark", and change the tempo to that of Watermelon. The dovetail is surprisingly natural. With the exception of the lead guitar, the backing tracks could actually be mistaken for the Joe's Garage version.. it's that close. The guitar is obviously someone else, in the spirit of a tribute to the music itself, and not just trying to sound exactly like Frank, which they obviously could if they wanted to. It's a fine rendetion, played with conviction and respect. 3. Aybe Sea- After a little bit of in-studio goofing-off, they stand and deliver. This one is kind of somber, almost like a requiem. As with much of the album, the arrangements are based on Frank's, so I'm just talking about the mood of the performance. This one would have been nice with a real piano.. if they were recording on a single ADAT then there probably was a strict budget, but this one comes off sounding a little like a midi version I downloaded from a webpage, played through my keyboard. That came off sounding overly harsh. It's a nice version. It's also very short, I miss hearing those last few piano notes trail off into the distance. Nice improv, though. 5. Filthy Habits- This is a very straight-ahead arrangement. Not very creative but very well executed and true to the original. 6. Twenty Small Cigars- Nice! The texture is thick and the feeling is relaxed. The bass player is probably on a fretted instrument but plays as if it were fretless, and finds a few tasty new counterpoint notes as well. The drummer holds back perfectly, letting the song move itself. (Nice drums overall, actually, and surprisingly good drum sound and mix for what apparantly is an 8 track recording.) This cut is shimmering with Fender Rhodes-ish keyboard chords and mellow jazzy guitar. Hypnotic. 7. Zoot Allures- A big phaser wash on the guitar opens this up with a surprise. The drummer smacks those toms around much like Terry used to do. This sounds more like the '75 version than what most bands cover, the '84 version. Oops, I take that back, the solo section goes into '84 reggae. Nice screamin' guitar solo, mixed kind of back, and not at all like Zappa. Oops, surprise segue..
10. King Kong Variations- Nice, this time it's the 60's version, no reggae this time around. Very swinging, great cymbal work by mr. drums.. now the band is kind of morphing into a free-form spacy tango kind of thing with some Dr. Who-sounding keyboards exploring the space. This drummer knows the exact function of a ride cymbal, THANK YOU drummer. So far the improv on this track is very original and creative, and has taken the most liberties with the arrangement so far on the album. Awesome guitar solo. They do some good and original things with this song. 11. Yet another segue, they sure do like the album to do that. I might add it's all done musically, as well, I don't think they attempt to edit the segues the way Frank did. I'm almost certain they are played that way. Anyways, here we go with a pedestrian rendetion of Mr. Grene Genes. Actually this song is Son Of Mr. Green Genes, a modern version of the Hot Rats arrangement. The performance is fine, I just wish they would have seen fit to take some liberties with the arrangement. Solos: gutiar, keys, guitar. If authenticity were what they were going for they would have done well with some vintage instruments. There's just no replacement for a big fat Leslie speaker. Vocals near the end are a nice touch! I dig their accents. "Eet yo' grins.."
12. Sexual Harassment- A+ for title selection.. I don't think I've seen this song covered anywhere else. This is a fun blues that the band apparantly enjoys to play. Nice "vintage" psychedelic lead guitar tone. It ends with a short teaser of "My Guitar". 13. Black Napkins- Great! This sounds live as if it were in front of a crowd, but I don't think it is. They've nailed the feeling of the late 70's performances of this song to it's essential mood. Splendid Brecker-ish sax solo, and some original axe-grinding. The keyboard punches sound just like Tommy, and the backup vocals are perfect as well. This is the most accurate cover I've heard of this song. 15. Blessed Relief- More skillful cymbalwork accent this swinging yet laid back version. The band really shines on this one, also a tune not covered very often. Swell keyboard solos and voicings all around, I think they altered the voicings slightly and it really does nice things to the song. This one get high marks for the album overall for my ears.. they've taken the Wazoo arrangement and just made it even easier. One thing this band knows how to do is groove well. Nice clean guitar solo with some doubled octaves and jazzy flourishes. The drummer really takes this groove where it needs to go, which is the hip pocket. Ends with a quote from Sofa. 16. This is probably the most covered song, but I never get tired of hearing different versions. This one does justice to the original arrangement without taking many liberties. I wouldn't say it's the high point of the album, but as you can probably imagine it leaves the project on a really nice note. I think the placement of this track and (and all the tracks for that matter) really bring out their strengths. Well, the disc is over and it seems like it's just begun. As you might have guessed I am pretty enthusaistic about this album and I wouldn't be without it. I hope we see some more good things from Fast & Bulbous. You can get their album from Hall Of Fame Records. Well, what are you waiting for? If you don't speak Spanish, don't worry about it, just address an e-mail in English to Luis and he'll help you out. Thank you very much from F&B for your review. In fact, you have centered many of our musical intentions. I am happy to speak with a competent person in music and more a FZ's music expert. I don't know what happens in Usa., but in Europe FZ fan=fetishist, people tightly interested in musical work of the Master is rare, and worse about those that are orientated on other artists. 5) Only T.S.C. is no-overdubbed. For conclude, I will hold you informed for next F&B and my works publications.